Itchy scalp presents a variety of symptoms including irritation, redness, a flaky scalp, crusty scalp, excessive oil and a dry scalp. Furthermore these symptoms may lead to hair loss. Most noteworthy, this may indicate a simple or a more sinister flaky scalp condition. So what will you do next? This depends on how you are being affected and what you are currently doing to treat the dry scalp. The GP is of course a point of contact as well as a local Pharmacy who may be able to assist you. However, if this isn’t offering a solution then you may want to seek alternative, professional advice from a trichologist. At the Holborn Clinic we advise and treat most crusty scalp issues. Email any questions you have by filing in the contact form or arrange a free telephone consultation with a trichologist. Alternatively, arrange a consultation in person. An Itchy scalp may be a symptom of: poor hygiene, inadequate rinsing, Scalp Eczema, Scalp Psoriasis, Dandruff, Seborrhoeic Dermatitis (aka the various forms of Pityriasis – Pityriasis Simplex Capitis, Pityriasis Rotunda, Pityriasis Circinata), Pediculus Capitis & Irritant or allergic reactions. Many of which are chronic conditions that may be controlled. Some itchy scalp conditions may be removed with treatment. Hair loss in some cases may present itself when an flaky scalp is present. If the crusty scalp is under stress through disease, the hair follicles may go into a resting state, which fails to produce hairs. Once the dry scalp has been treated the hair growth may return to that of the norm. Why not give us a ring and have a chat with a trichologist right now? We will assess your flaky scalp condition on the phone and offer advice. It may be necessary to attend our clinic for a more in-depth assessment. Please note that we are unable to confirm a diagnosis on the phone. However, we may be able to offer a solutions for a crusty scalp depending on the circumstances. So why not give us a call and speak with a Trichologist. You may wish to arrange a consultation at the clinic to discuss a flaky scalp condition. This is always the best option. During the consultation we will examine the dry scalp under microscope if needed and establish a diagnosis. In addition we will discuss your medical status and explain in full what is causing the crusty scalp. As part of the consultation we may advise that treatment is appropriate. We will take you through the process and you will see the results. Treatment is of course optional. 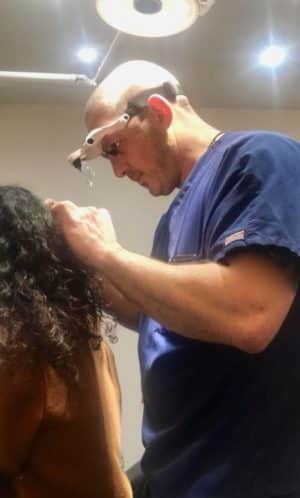 If you would like to arrange a consultation at the Holborn Clinic with a TTS Trichologist then either give us a call or fill in the contact form above or at the bottom of the page. Don’t forget you can have a free consultation on the phone with a trichologist first. Thank you and hope to see you soon. Presenting symptoms as thick scales that grow up the hair shaft. The condition resembles asbestos hence the name (Amiante French word for asbestos). The image to the left shows before treatment. The image to the right shows treatment after one session at our clinic. We deal with most flaky scalp conditions that affect the skin. Give us a call or email us and I am sure we can assist you. Thank you. The Holborn Clinic team help many patients to deal with their itchy scalp at home. Removing certain products in your daily routine will suffice. Potentially, washing routines may be changed along with technique. Some shampoos that are apparently designed for itchy scalps can exacerbate the condition because they are often harsh on the skin. Give Us a call and speak with an expert now!. An itchy scalp can be dealt with at home in some cases. The correct professional advice should be sought first. We have products that deal with a range of itchy dry scalp conditions. We may be able to advise on the phone what to use but in most cases we would need to see you in person to confirm a diagnosis. Our products are only available to purchase after speaking to a qualified trichologist. We would need to see you in person to advise and treat the more serious or chronic itchy scalp conditions. Itchy scalps tend to cause the skin to proliferate at a greater speed hence the treatment involved slowing this process. It is the accelerated growth rate that caused the flaky scalp and the itching along with other factors. Treating the itchy scalp involves removing the crusting and calming the underlying skin, slowing the cell growth and removing the itch. Please note that removing the crust is a specialist skill that should not be attempted at home. We can offer relief from irritation and remove much of the crusty flaky skin. 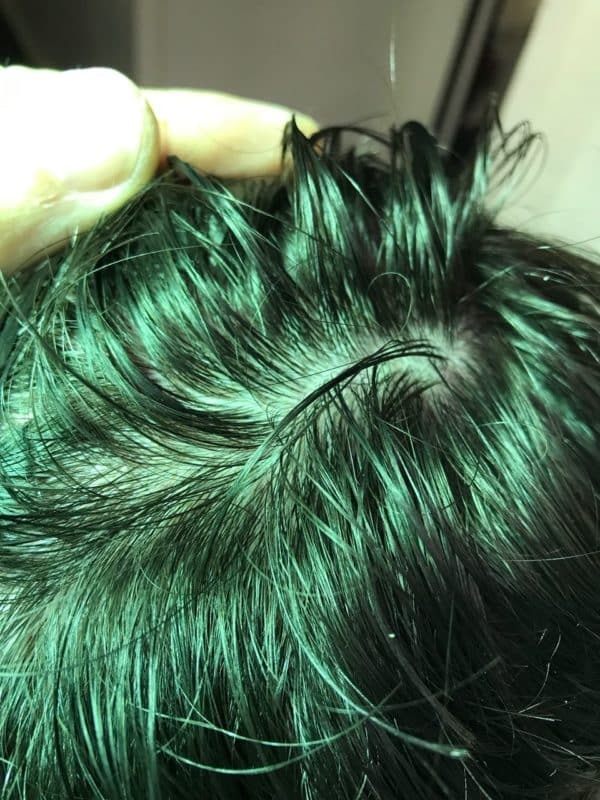 In the majority of cases we are able to control or in certain conditions remove (chronic or acute) scalp conditions within a relatively short space of time with limited cost to the patient. Please contact our help line to find out about out treatment techniques and what we can do for you. In many cases we are able to offer some home care solutions to aid recovery after consultation. May lead to an itchy scalp and possible secondary infection. The scalp in all cases needs proper cleansing and should in most cases be washed at least twice a week. The application of oils and other such items to keep the scalp moist may well exacerbate the condition contrary to belief. If you are in any doubt please contact the help line and you can speak to a trichologist now. Many patients suffer from an itchy inflamed scalp a result of a contact reaction. Often due to hair dye or styling products. A contact reaction may cause severe discomfort, pain, erythema and of course irritation. So you are well advised to always get a contact reaction checked out as hair loss may follow. Please note the hair loss will not happen immediately, it will occur months later. Psoriasis is a condition that affects the whole body. The scalp is a particular region that causes many people distress and unsightly legions. 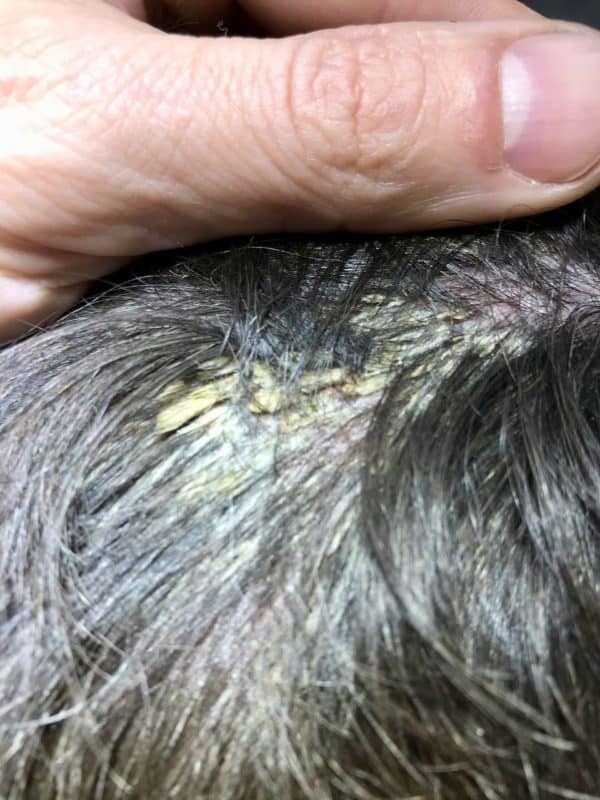 The skin thickens and sticks together forming a white or sometimes yellow scalp. The skin underneath is red and inflamed. Statistically 3% of the population are affected. Affects males and females alike. Psoriasis is not contagious. Genetic predisposition is common. Atopic Dermatitis is a common condition in both adults and children albeit the its the children that are affected more. Both Men and women are affected equally. The Condition tends to start may be during infancy (first few months) Symptoms include Crusting, weeping, pruritic, erythema typically on the face, scalp and genital region. Further information on Atopic Dermatitis. You may be an atopic type which means that you are susceptible to hay fever, allergens and skin ailments. If you are suffering from any skin condition you should seek professional advice. There are many companies selling wonder potions and cures which are expensive and may cause the condition to worsen. Often causing an itchy scaly scalp. Scalp eczema is a non contagious chronic or chronic itchy scalp conditions characterised by one or more of the following: oozing and weeping, erythema (inflammation), skin thickening, presences of papules and vesicles (blisters). Pruritis (itchy burning scalp, sometimes severe) leads to excoriation and possible bleeding. Affects all ages. Secondary infection may be present. Scalp eczema though not curable can often be successfully managed. Affected skin is susceptible to flare ups. Scalp Eczema is categorised into environmental and internal. Further information on Sale Eczema please click here. There are numerous other diseases and ailments that affect the skin. The information above has only touched the surface. Some conditions are more sinister and present a multitude of symptoms. The itchy scalp may only seem a minor issue but an itchy scalp an be a symptom of skin cancer. Whoever you choose to see I would in all cases seek professional advice. If you had a rash on your face that just appeared and remained, would you leave it or go and find help? Many patients that attend the clinic for an Itchy scalp condition tell me they use “natural oil” such as coconut and t-tree oil because it keeps the scalp moist therefore solving the itchy scalp problem. It is because of the oil that in many cases the skin continues to have an itchy scalp. The application of oil will in some cases assist to remove the crusting that often goes along side an itchy scalp therefore masking the problem. The continuing use of oil on the scalp may well lead to complications such as dryness. Yes it can dry out the skin. Think of what happens when you have your hands in washing up solution? Your hands are dry and need some moisture right? Well the application of oil that remains on the scalp may well have the same effect therefore the skin has a masking agent (the oil) covering the head. Do not to apply oil on the scalp and leave it for days and potentially weeks without removing it. Your scalp needs to be free of any products, lotions, potions and oil. The scalp needs to be able to at all times at its original state. Yes moisture is a good thing in some cases to assist the skin because some people have a scalp condition such as scalp eczema or Psoriasis that requires extra moisture. But it needs to be the right application. Please be mindful that if you have an itchy scalp condition and are a person that uses oils on the scalp on a regular basis the sudden removal of oil will probably cause the skin the present a dry scalp because it is used to the oil. It would be in you best interest to contact a specialist for advice. You can give us a call and speak with a trichologist right now. Alternatively, you can have a read of the site and see if that helps. Remember, if you have scalp ailment then there may be something that could cause hair shedding. A scalp that is uncomfortable may cause hair loss but not right away. It will happen several months later. Olive oil when warm may assist in softening the crusty scalp therefore it can loosen the flaky skin on the surface. The patient should warm the oil, rub in your hands and apply to the flaky scalp by massaging in. The oils should be left for several hours or over night therefore giving the dry scalp amply time to release the crusting. This is a common method used today because it will help remove the crusty scalp excess skin. Most importantly you should make sure that all the oil is removed after treatment. You should be aware that oils can make an itchy scalp worse if used in the wrong circumstance. Everyone is different and we will react in varying ways when oil is applied to the a crusty scalp. Establish a diagnosis first before attempting any form of home care. Feel free to call the clinic for advice. Colloidal Oatmeal is found in some crusty scalp treatments. Colloidal oatmeal is a natural ingredient dissolved in water. The application forms a film on the dry scalp which locks in the moisture therefore keeping the skin wet. This can assist in removing the unwanted flaky scalp skin and can help in reducing the itchy scalp. Colloidal Oatmeal is well known as an anti-inflammatory and holds antioxidant properties which may help an itchy scalp. Most importantly, like the oil, the skin can react to such applications in a negative way therefore you should always establish a diagnosis prior to attempting home care remedies. Containing a natural substance known as acetic acid, apple cider vinegar is used as a wound treatment as it holds antibacterial and antifungal properties. Furthermore it is used to help a crusty scalp condition. Advice should be sought prior to attempting such a crusty scalp treatment. Psoriasis sufferers use this to assist in relieving the itch. The national Psoriasis Foundation suggest that diluting the apple cider vinegar in water to a ratio of 1 and 1 (1 part vinegar and one water), apply to the crusty scalp and wait until dry or rinse after a few minutes. Apple cider vinegar should be used with care as applying to cracks or wounds causes burning. In fact, this treatment can cause severe chemical burns therefore you should seek professional advice when using such a remedy. Peppermint oil can assist in relieving an itchy scalp. It contains high levels of a natural ingredient called menthol. The application of peppermint oil on the dry scalp may offer a cooling effect which call assist in relieving the irritation caused by allergens. Peppermint oils should not be used on a crusty scalp in its neat form. It should be diluted. This form of treatment is often used by applying a few drops in shampoo. Be warned, applying anything to a shampoo could cause a chemical reaction which could cause damage to the skin. Before using such a remedy you should seek professional advice. Lemongrass oil is another perhaps lesser known remedy used to assist in the treatment of dandruff and the itchy scalp. Trials have established that this in some cases has been effective. The effectiveness of any treatment on a crusty scalp depends on the recepients skin and how it reacts. Care should be used in applying any such treatments to the dry scalp because a skin reaction may occur therefore professional advice should be sought in all cases of itchy scalp. Tea tree oil is often used as a treatment for head lice. Studies have shown that headlice don’t like tea tree oil and the application of tea tree oil can kill headlice. In addition the diluted application on the affected dry scalp can help prevent the spread. My daughters both have used tea tree oil on a daily basis and have never suffered from headlice. Nerlidol is a natural substance found in plants. This is another remediy for headlice. Deemed less effective that tea tree oil therefore used less. Salicylic acid is a natural chemical found in plants. Holding excellent anti-inflammatory and antibacterial properties, this is commonly used in the treatment of itchy scalp conditions. Salicylic acid assists in exfoliating the crusty scalp therefore a good treatment for the itchy scalp. Selenium sulphide often found in crusty scalp shampoos works by slowing the rate of cell growth therefore if can prevent the build up of flaky skin. It can have an effect on reducing the yeast found on the scalp which often contributes to dandruff and other skin ailments causing the itchy scalp. Selenium Sulphide can discolour the skin. Care should be taken when using any home care products and a correct diagnosis should be sought in the first instance. Ketoconazole is a common ingredient found in dandruff treatment shampoo. Used to combat the build up of yeast Malassezia on the scalp. Not suitable for children (under 12) or pregnant females. Many skin ailments cause skin breakage therefore the use of this form of treatment should be avoided if such symptoms are present. This is often the first treatment that will be offered by your GP. The Afro Scalp is susceptible to an itchy scalp like that if other skin types. Make sure you keep the scalp clean and void of chemicals. Furthermore the use of black hair products can contribute to flaky scalp conditions.Correct Afro Scalp Cleaning should be adopted. Afro Scalps suffer more from itchy scalps due to the lack of cleansing. I appreciate that afro hair is weaker and tends to break easier. This is the reason why it is common practice not to wash too often. You must keep the scalp. The hair itself doesn’t need to be washed. The Rinsing the hair alone is sufficient. This about it, would you leave your face for a week without washing it? Have a look at the afro scalp page or the afro scalp cleansing page for more information. Afro Hair loss is often caused by a flaky scalp condition. If the skin is unhappy then hair loss may well follow. Hair loss can be slight and not noted. It can also be extensive. If you are suffering from a a skin condition please get it looked at and don’t try and self diagnose. It may well be that you are suffering from a minor skin issue that is early dealt with. It may be the symptoms of a more sinister hair loss condition. Have a look at our page on Afro Hair loss which may assist you. Other hair loss conditions include Telogen effluvium, Hair shaft defects, Alopecia Areata, traction alopecia, atopic dermatitis etc. There are many others which are listed above in the menu. Can I dye my hair with a dry scalp because I want to? Do not dye your hair. The skin is unhappy at present because of a skin ailment. Find out what is causing the problem first before thinking of colouring your hair. Test your hair each time. Test the skin as well. Think about it. It might be the hair dye that is causing the problem. I am losing my hair at the moment. Will it all go? I have an itchy scalp. Go and see a trichologist. You are loosing hair and this may well continue until you establish a cause. You need to establish what is happening first. Finally, The hair is unlikely to all go but it could shed considerably. I am about to buy some scalp cream of the internet. Oh and I have head and shoulders shampoo. Will that help? You are buying scalp cream? What condition do you have? What is in the scalp cream? Is this from your Doctor or pharmacist? Using scalp cream without knowing what you have is wrong. Be diagnose first. Then take advice on what to use. Head and shoulders is a good shampoo to assist with dandruff. First of all I am Black. Furthermore I have seen two trichologists before. One sold me a shampoo. It seems like this has made it worse. It’s hair loss in patches and a flaky scalp. It seems like you have been given the wrong treatment. Above all you don’t have a diagnosis. First of all, how long has this been affecting you? How large are the patches? Have you had any blood tests? Similarly, is the skin red? inflamed? Rather than me attempt to give you an answer, I would ask you ring me as soon as you can to discuss your ailment. I must see the scalp which can be done via Skype or email. Above all, i want to see the severity and how it is affecting you.